Discover Spain with the most incisive and entertaining guidebook on the market. 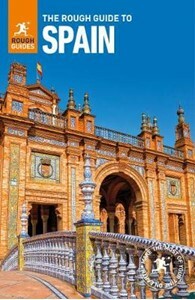 Whether you plan on exploring Andalucia's White Towns, sampling the legendary nightlife of Madrid or hiking in the Picos de Euuropa, this new edition of The Rough Guide to Spain will show you the ideal places to sleep, eat, drink, shop and visit along the way.Inside The Rough Guide to Spain- Independent, trusted reviews written with Rough Guides' trademark blend of humour, honesty and insight, to help you get the most out of your visit.- Full-colour maps throughout - navigate the backstreets of Barcelona or Granada's Albaicin without needing to get online.- Stunning, inspirational images - a rich collection of inspiring colour photography.- Things not to miss - Rough Guides' rundown of Spain's best sights and experiences.- Itineraries - carefully planned routes to help you organize your trip.- Detailed city coverage - whether visiting the big sights or venturing off the tourist trail, this travel guide has in-depth practical advice for every step of the way. Areas covered include: Madrid, Segovia, Toledo, Castilla-La Mancha, Extremadura, Andalucia, Castilla y Leon, La Rioja, the Pais Vasco, Navarra, Cantabria, Asturias, Galicia, Aragon, Barcelona, Catalunya, Valencia, Murcia, and the Balearics. Attractions include: Museo del Prado, Reina Sofia, El Escorial, Merida, the Alhambra, La Mezquita, Parque Nacional Coto de Donana, Univeridad de Salamanca, Burgos Cathedral, Museo Guggenheim, Santiago de Compostela's cathedral,Sagrada Familia, Fundacio Joan Miro, Teatre-Museu Dali, La Ciudad de las Artes y Ciencias, and the Palma Cathedral.- Basics - essential pre-departure practical information including getting there, local transport, festivals, culture and etiquette; sports and outdoor activities, tourist information and more- Background information - a Contexts chapter devoted to history, wildlife flamenco and books and with a handy language section covering Castilian (Spanish), Catalan, Basque and Galician.Make the Most of Your Time on Earth with The Rough Guide to Spain About Rough Guides: Escape the everyday with Rough Guides. We are a leading travel publisher known for our "tell it like it is" attitude, up-to-date content and great writing. Since 1982, we've published books covering more than 120 destinations around the globe, with an ever-growing series of ebooks, a range of beautiful, inspirational reference titles, and an award-winning website. We pride ourselves on our accurate, honest and informed travel guides.